As a gluten free fermented probiotic performance drink, InnergyBiotic can help your true energy soar and make your gut happy! How would you like a healthy low-calorie source of probiotics that is gluten-free, and that also provides you loads of energy so - whether at home, in the office, or at the job - you don't have to feel tired, sluggish and "zapped" anymore? In today's line up of energy drinks and sports drinks, you are often getting nothing more than sugar mixed with inferior protein and questionable vitamins and minerals. These drinks boost your energy for a short time...perhaps they promise to replenish your electrolytes... but actually steal energy and vitality from your long-term health. What if you could heal your digestive tract (your inner ecosystem), revive your energy and get healthy probiotics in one convenient and delicious all-natural liquid? The Body Ecology line of probiotic liquids - which also includes CocoBiotic & Dong Quai -- heal your gut and boost your immunity by providing you a range of healthy probiotics. InnergyBiotic, is the brand new addition to the Body Ecology line of probiotic liquids. It just may be our most delicious probiotic liquid yet. Yes, it is healthy and healing but we named it InnergyBiotic because it makes you feel energetically alive and happy by creating true energy from deep within your hara or power center...your intestines. InnergyBiotic is special because it was created by fermenting a blend of gluten free grains, grain-like seeds andbeans...all sources of easily digested vegetarian proteins. 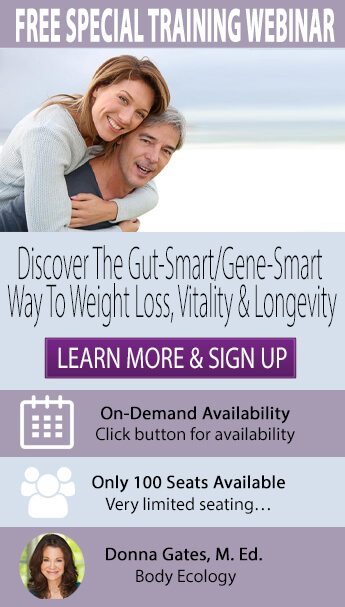 InnergyBiotic IS the "Ultimate Next Generation of Probiotic Supplements! Innergy Biotic not only provides you with beneficial microflora to improve digestion, it also contains specific ingredients such as high performance peptides, (easily digestible protein sources), antioxidants and other nutritional ingredients." More than a healthy, energizing liquid, InnergyBiotic can help your body recover from the physical demands of work, exercise or illness ... and give you a healthy, long-lasting boost of energy while also BENEFITING your body long-term. Boost your energy - Probiotic-rich InnergyBiotic boosts energy because it helps correct digestion and improves immunity, giving you a natural, lasting energy boost. When the foods you eat digest well you feel this as a boost of energy. Heal your gut - Body Ecology promotes healing your inner ecosystem and probiotics are key to a healthy gut. The probiotics in InnergyBiotic are targeted to survive stomach acid that kills most probiotic supplements. The special blend of microflora in InnergyBiotic help recolonize your intestines quickly, furthering the healing process. If you look at the nutrition labels of the so-called sports drink or energy drinks, you'll see a lot of quasi-foods and forms of sugar. These designer drinks are like candy in a can, giving you instant gratification in the form of a sugar high. InnergyBiotic is the best energy drink and sports liquid because it goes way beyond instant gratification. With InnergyBiotic, you get a probiotic-rich whole food in liquid form, making the protein and microflora more bio-available for your body. You get energy that lasts and a protein-carbohydrate drink that supports muscle recovery. Quinoa's health benefits include preventing and treating artherosclerosis, breast cancer, diabetes and insulin resistance. Organic Millet - a "grain-like" seed, millet nutrition is important for B vitamins, magnesium, calcium, tryptophan, fiber and antioxidants. Millet nutrition has been noted for reducing cholesterol, type 2 diabetes, migraines and headaches. IMPORTANT: Fermented foods and drinks containing both a probiotic and a prebiotic are called a synbiotic. Thesynbiotic effect from blue agave, honey, the gluten free, grain-like seeds and the brown rice in InnergyBiotic means that not only does it help populate your intestines with beneficial microflora (probiotics), it ALSO helps improve the survival, implantation and growth of newly added microflora strains. The microflora consume this sweet food, yet leave you all the benefits of the pulses, seeds and grains. Delivered in a delicious ready-made format, naturally-fermented Body Ecology liquid probiotics nourish and support your inner ecosystem, quickly and efficiently delivering vital intestinal microflora to your hard-working digestive system. Able to survive harsh stomach acids to reach the walls of your intestines and recolonize it more effectively. Natural to the human GI tract. antioxidants AND a synbiotic blend of probiotics, InnergyBiotic is your health enhancing performance drink! Whether you want to climb Mt. Everest, make it through a long day at work or create lasting energy for your future health, InnergyBiotic is a delicious way to build deep inner energy... true energy... so you can start performing at your optimal best!